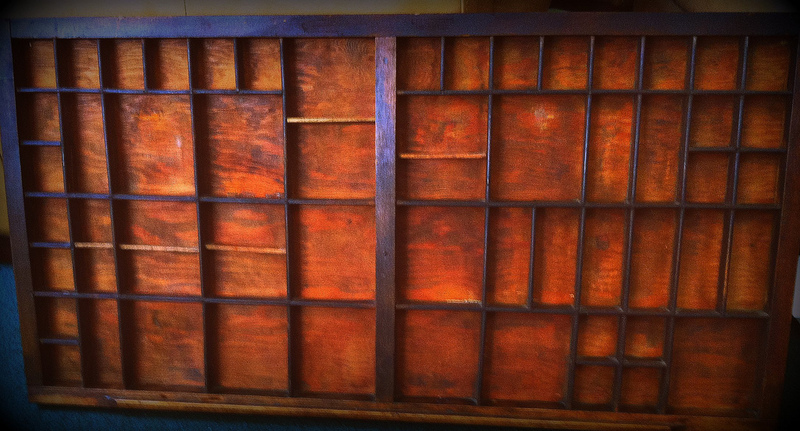 Over at Crazy Suburban Mom, Tracy wonders what to do with antique printer’s trays. Is it best to hang them or set them on something – And do you set things in them or attach them inside the little boxes? Although, we shouldn’t overlook the original and obvious intent of keeping it flat, storing and organizing anything from screws to Legos in it. But this is a collectors’ blog, so I’m going to stick to displaying collectibles. Plus, as the drawer has no cover, it would need to be stored flat in a place not likely to be disturbed. (If you have one of those places, please tell me how to get one! lol) I highly recommend the wooden drawer is to be hung on the wall for the most visual appeal; you can use small amounts of museum putty to hold the items safely and securely in place. I remember that my mom once used to display her thimble collection in a printer’s tray. If you have a collection of “the same things” to fit inside, this is the ultimate way to keep things from looking like a “big ol’ hairy mess.” As many decorators advise in general: keep to a theme. Here’s an example of glassware and travel souvenirs; however, even those pieces are likely too large for the spaces in a drawer meant to hold printers blocks. You might have smaller items on a theme… Buttons, marbles, shells, rocks and minerals, pinbacks, vintage game pieces, jewelry, coins, fishing lures… Even if only half the little objects on display are say, marbles, the number of them will move the eye about and give the cohesive look of a theme. Another interior design principal for creating a unified look is to select a color palette for the items on display. Since the antique wood is rather dark, and the spaces small, I’d suggest light colors to create more of a contrast and visual interest; perhaps whatever bits and bobs you have in shades of white and ivory… Again, even if you can’t carry the color theme throughout the entire drawer, proper placement, spreading the items of common color around, will create the impression of a carefully cultivated, organized collection. Personally, I find little displays of “whatever” to be quite charming. 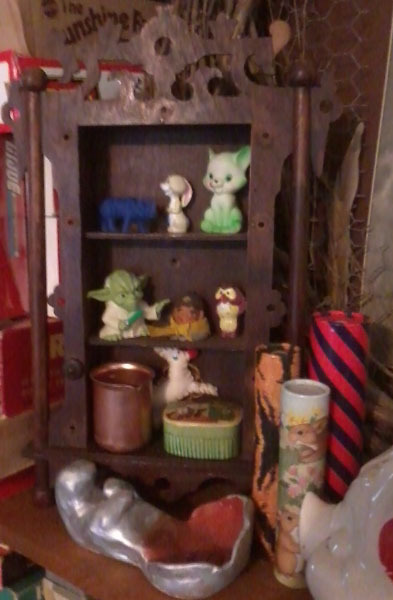 Here’s an small wooden antique shelf, with nicely scrolled details, that I’ve put little bits of random childish sentimental loveliness upon. Yes, every item in there has a story — and it’s my hope that whoever visits our house will ask to hear each and every one!